Orlando Chamber Choir battles it out with a famous French song of battle, and wins with a Spanish Mass for Victory. 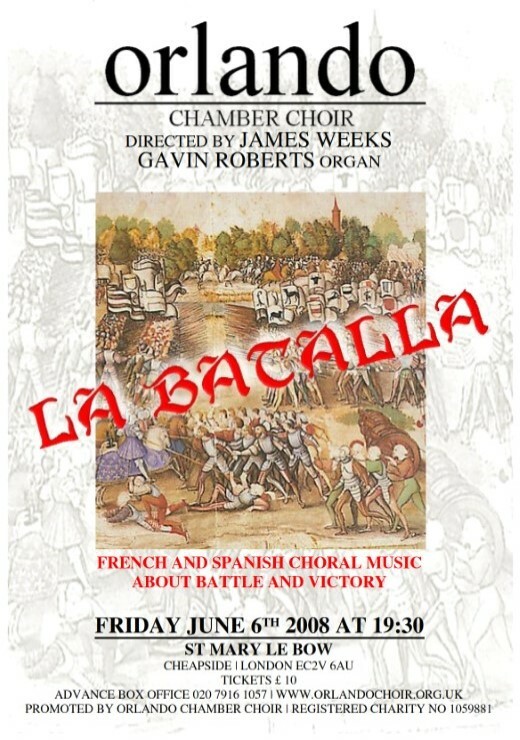 In the famous chanson La guerre by Clément Janequin the choir imitates hectic sounds of battle including trumpet calls, cannon fire and cries of victory. The chanson inspired Spain's foremost Renaissance composer Tomás Luis de Victoria to write his extravagant nine-part Missa pro victoria - said to have been a favourite of the Spanish King Philip III, so our concert comes with royal recommendation. The programme also includes choral works by Juan Cererols and organ works by Antonio de Cabezón and Sebastian de Heredia.